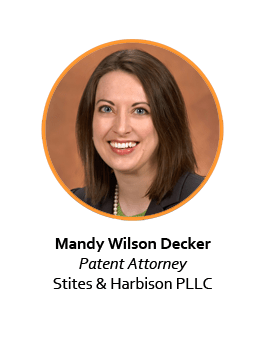 Mandy Wilson Decker is a Patent Attorney and is a member of the Intellectual Property & Technology Service Group. Her practice focuses on intellectual property protection strategy, including counseling clients on infringement, validity and patentability, transfer of intellectual property, patent drafting, and patent prosecution. Contributing to her practice is a scientific background in chemistry and experience with academic and commercial research in the areas of biochemistry, biotechnology, and pharmaceutical sciences. Mandy is currently Chair of Stites & Harbison’s Women’s Initiative, S.W.I.F.T., a member of the firm’s Diversity Committee, and a past member of the firm’s Ethics Committee. Developed intellectual property portfolio protection strategies for various research institutions, universities, private companies, and entrepreneurs. Prepared and prosecuted patent applications in a wide variety of chemical, biochemical, pharmaceutical, cosmeceutical, dermatologic, biotechnological, medical, and mechanical arts derived from both academic and commercial research. Managed international patent portfolios and prosecution involving applications and patents in regions and countries including Australia, African Union (OAPI), Brazil, Canada, China, Europe, France, Germany, Greece, Hong Kong, India, Ireland, Israel, Italy, Japan, Korea, Liechtenstein, Mexico, New Zealand, Russia, Singapore, South Africa, Spain, Sweden, Switzerland, the United Kingdom, and the United States. Assisted in negotiation of agreements to transfer or license intellectual property rights. Mandy joined the firm after working as a scientific research associate at the University of Kentucky in laboratories housed in the Advanced Science Technology and Commercialization Center. These labs received substantial funding from the National Institutes of Health to conduct research to better understand responses to genotoxic stress, and its implications for treatment and prevention of cancer and age-related conditions. Mandy’s scientific research experience also involved working with Niadyne, Inc., a biotechnology company involved in the research and development of dermatology products, including cosmeceutical and pharmaceutical skin care products to address various health care needs. Ms. Decker is a frequent author and speaker on scientific and legal topics. Her recent contributions include: Presenter, “Intellectual Property,” Kentucky Innovation & Entrepreneurship Conference, Louisville, KY, June 1, 2012; “U.S. Supreme Court kicks Myriad, the Gene Patent Case, back to the Federal Circuit for consideration in view of the Mayo Opinion,” Stites & Harbison, PLLC, Client Alert, March 27, 2012; “U.S. Supreme Court decision gives rise to new challenges for patent protection in the field of personalized medicine and beyond,” Stites & Harbison, PLLC, Client Alert, March 21, 2012; “America Invents Act: What’s New in the New Patent Act?,” Medical News, December 2011; lecturer, “Patent Prosecution,” University of Kentucky, College of Law, Intellectual Property Law, November 17, 2011; lecturer, “Intellectual Property,” University of Kentucky, Scholars in Engineering and Management (SEAM), Lexington, KY, October 27, 2011; “Protecting Your Intellectual Property,” University of Kentucky Von Allmen Center for Entrepreneurship and Kentucky BioAlliance, Lexington, KY, October 13, 2011; “Developing and Integrating a Comprehensive IP Strategy in a Global Marketplace,” Kentucky BioAlliance (KSTC), Louisville, KY, June 21, 2011; and “Mutant court case? The uncertain future of innovation for DNA-based technologies, from diagnostics to vaccine production tools,” Medical News, Louisville, KY, May 2010. Mandy was named to the “Forty under 40” list by Business First of Louisville in 2008. In 2011 she was named one of the Partners in Health Care People to Watch by Business First of Louisville, and in 2012 she was named a Partner in Health Care by Business First of Louisville for her contributions to the Life Sciences Community. She is a member of the Board of Directors of Kentucky BioAlliance and she serves on the Annual Campaign Committee of the Legal Aid Society. Ms. Decker is admitted to practice in Kentucky, the U.S. District Courts for the Eastern District and Western Districts of Kentucky, the United States Patent and Trademark Office and the U.S. Court of Appeals for the Federal Circuit. Ms. Decker received her JD and BS in Chemistry from the University of Kentucky.